To Dog With Love: Beneful to Unveil America's First Dream Dog Park in Atlanta! Beneful to Unveil America's First Dream Dog Park in Atlanta! If your dog could design his dream dog park, what do you think it would have? ... a giant, bone-shaped pool with a sandy beach? A treat dispenser? Lots of stuff to climb on and jump over? I know that's what Cosmo would like. Tomorrow, we'll get to visit the unveiling of America's First Dream Dog Park, the dream of another Atlanta dog, and we can't wait to see what it holds! humans who came to visit the dog park together. Well done Pat and Koda! High Paw! It's a $500,000 makeover from the folks at Beneful, designed by DIY celebrity Jason Cameron. 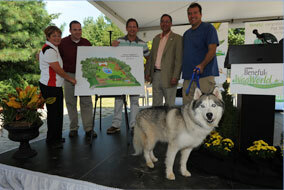 And it's all right here in the Atlanta area thanks to Johns Creek resident Pat McNeely and his Siberian Husky Koda. The pair won the first ever Beneful Dream Dog Park Contest, inviting dog owners across the country to share their ideas for the ultimate dog park. Not sure it'll have a treat dispenser, but we've heard there are more features than we can possibly imagine including a 3-D bone bridge, water splash pads, tunnels and plenty of shade trees for us humans and the doggies. And there's a separate area for small dogs, which will make Cosmo very happy! Here's Pat and Koda's winning video... Wow! No wonder they won the Grand Prize. We can't wait to meet them and shake their paws! the community to enjoy for years to come. 11 a.m. -- 1 p.m. If you have a dog park in need of a makeover in your neck of the woods, there's still time to enter this year's Beneful Dream Dog Park Contest! All the details here. You have until June 21 to enter your essay and photo. If selected as one of the finalists, you'll be asked to create and submit a video. So cool! Cant wait to see how it turns out! Cosmo, so jealous you got to go!! Let's meet there soon! Absolutely love this idea.I'm in love with your pets and I'm excited to buy one!